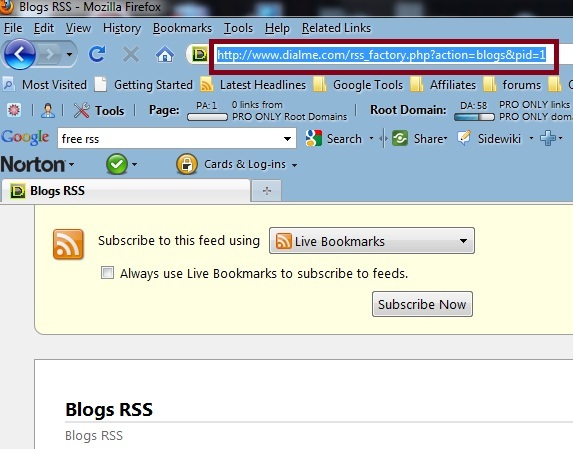 One FREE and easy way to generate more traffic to your Dolphin 7 site or any other site you maintain is to submit it to FREE RSS feed directory sites. Since Dolphin 7 comes with a variety of RSS feeds built into it this can be very fast and easy. All you need to do is find your Blog, Article, Forum, etc. 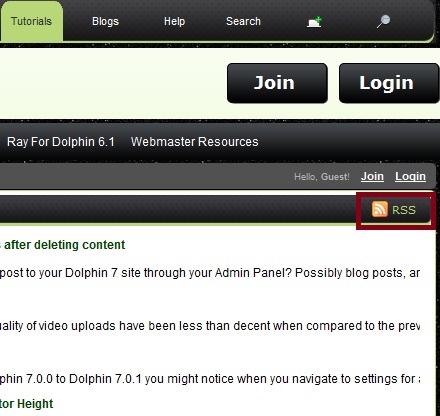 RSS feed or link in your Dolphin 7 site. If you post a lot of blogs simply navigate to the list of your blogs. Something like (http://www.yoursite.com/blogs/posts/yourname) then select the blog link. You will then find the RSS button in the Actions menu. 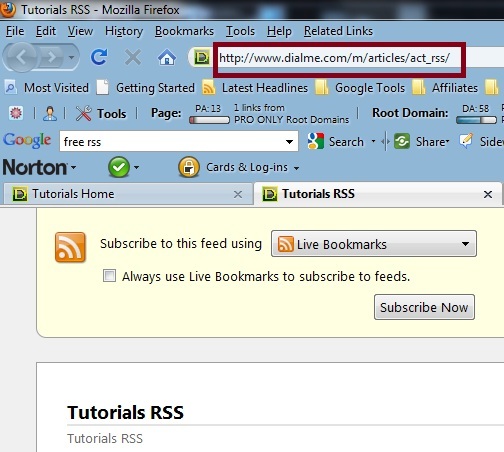 Just click it to find the actual RSS feed link for your particular blog. To find your Dolphin 7 Articles RSS feed simply navigate to your articles page (http://www.yoursite.com/m/articles/index/). Then, find in the right hand corner the RSS link or button. Note: My Articles say Tutorials because I have changed them. They are really Dolphin 7 Articles Module though. 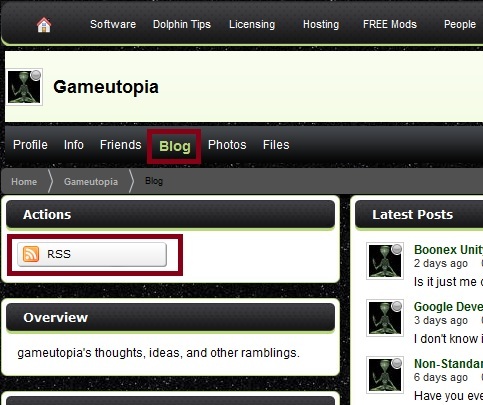 Ok that takes care of how to go about finding and determining your Dolphin 7 RSS feed links. Now you just need to submit them to FREE RSS Feed Directories. Where do you find them then right? You can ask Google. 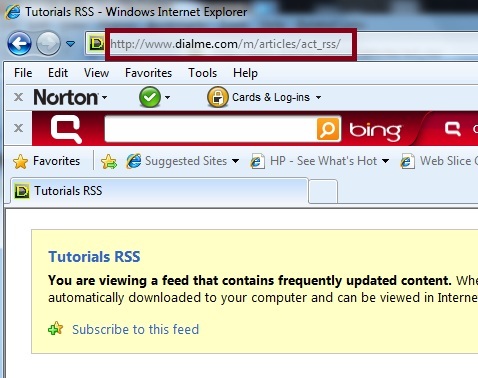 Both have a list of links to RSS Feed Directories you can submit to. Most of which you do not even need to sign up or become a member to do so. Now all I have to do is enter my Dolphin RSS Feed we determined above, choose a Category, and Subcategory if necessary, then just click the submit button. Then if I wanted to also submit my Dolphin 7 Article RSS Feed I would repeat the process with my article rss link. 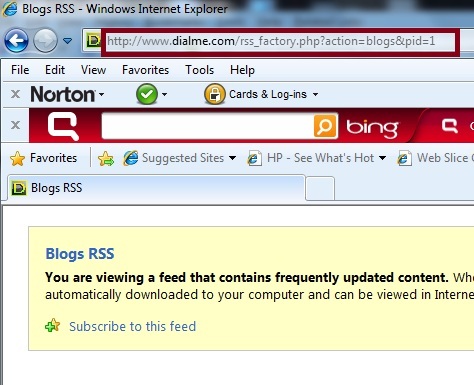 Some RSS Directory sites will take you directly to the submission page. Others you will have to find the submit rss link or similar. There are plenty of free ones out there. Some may be out of date or no longer available. Just continue down the list. There is no way to guarantee traffic or how much traffic you might see from RSS Directories, but for free you aren't out anything except for a little time. The link I posted above http://www.masternewmedia.org/rss/top55/ has more than enough to keep you busy for a while. They are something to mess with in your spare time, and you really never know what kind of traffic you might see out of it. Which shows you how to use the same Dolphin 7 RSS Feeds to tell Google where to find you pages for faster indexing into Google search.